Hi everyone. We're having yet another warm up here today, which is another tease before the next storm arrives in our direction this weekend. What a winter- as I am sure many of you will agree. Typical of me, I am good with winter until February and then I can't take it anymore. Unfortunately I must, but I can dream about summer and so that's the theme of my page today. I am linking up to Art Journal Journey where Rike is hosting this really fun challenge: Animals A-Z. The hardest part of this challenge is picking an animal to make a page about. I started my page with a Gelli printed background (made on some printed paper-you can see some of that peeking through). I saw the flowers and that made me think of hummingbirds. I don't know what bird is my favorite as there are so many fascinating ones, but hummingbirds are definity one of the most interesting. Hope everyone is well, and I appreciate your visit to my blog. I can feel the movement and energy put off by those fast flying hummingbirds. They are adorable and I was also impressed with how you changed that background, too. It's a stunning entry for Art Journal Journey today. Thanks for sharing it with us, Erika. Your hummingbird page is beyond beautiful Erika! Just Amazing - the vibrant colors and all the fantastic patterns - it reminds me of summer and tropical feelings! Gorgeous! Thanks a lot for another fabulous entry to Rike's theme! Happy Thursday my friend - weekend is near! Wow, your background is terrific, so much depth! I love your green hummingbirds each with a crown on its head, flitting around in a circle - the "dancing kings"! Fantastic colors you chose! I don't like winter - it is grey and brown and cold, because we have no snow here. I too dream about spring and summer and so I like your page very much! Thank you for joining us again at AJJ, much appreciated! Your page is beautiful and I love hummingbirds they come back to visit us mid april. 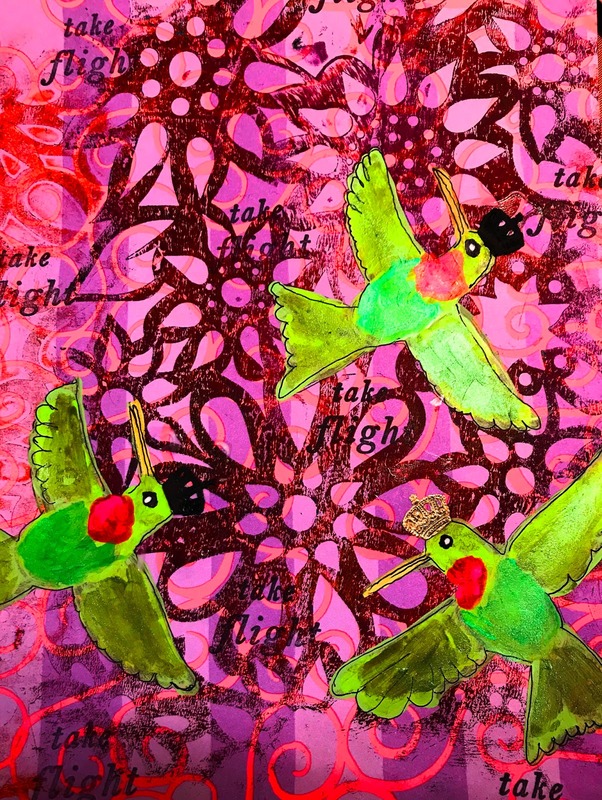 That's a gorgeous background for those regal hummingbirds Erika! That is a gorgeous colour for your background. , it for sure, brightens up what has been another dull day here today. I love your Humming Birds as well. You made me think about what bird would be my favourite, maybe I would choose a Robin, but have to say it would be a hard choice to make and choose just one. Another fabulous vibrant page! The green hummimgbirds really pop against that background! Like you, I am more than fed up with winter, - roll on Spring!! Love the colors in this. (I like hummingbirds, too). Hope you survive the snow storm. Maybe you're getting ours a week late! We're due for rain this time. And Monday, 50. Go figure. Our whole world's temperature/water situation is in a pickle! Oh wow, what luminous colors dear Erika. I love the wonderful ornaments on the background and the crowned hummingbirds. Great page!